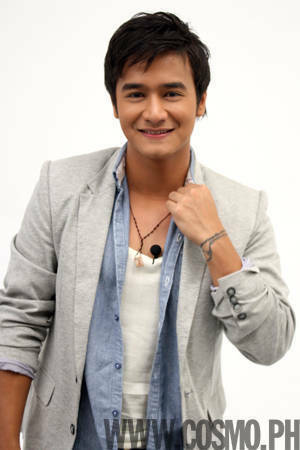 JM has been in the biz since he was 14 and cast in Ang TV 2. To date, the 22-year-old has appeared in indie films (like Rekrut), mainstream movies (he was Eric in My Amnesia Girl), and primetime TV series--from ABS-CBN's Precious Hearts Romances: Midnight Phantom to the recent remake of Mula Sa Puso. The hot star continues to rise and gather heat. He takes his craft seriously and continues learning through stage productions in his alma mater theater group Dulaang UP. Since June is Cosmo.ph's back-to-school month, we asked JM about his college life in UP Diliman (where he took up Certificate in Theater Arts, Major in Performance Studies) during our chat with him. We found out that acting isn't the only thing JM can do to please a crowd. He's also a singer-songwriter, with an album on the way! And, he has won medals in various martial arts competiti0ns back in college--at one point, he was even the president of UP's Wrestling Club. Above all else, he knows how to work the camera, and he brought his heartthrob stage presence to the set of his Cosmo shoot. Photographer Roy Macam wanted the shoot to be "very simple and straight to the point--to show how JM is in front of the camera as a model, and not as an actor." In line with the concept, stylist Sidney Yap went for "a really relaxed look for JM...but still polished," hence the denims paired with blazers. Browse through the gallery to see behind-the-scenes pics of JM and how he brought his charm and captivating presence to the shoot at the Summit Studio. In case you haven't yet, watch our interview with JM on Cosmo TV, where he talks about his college days, his ideal girl, and his rumored off-screen romance with Lauren Young (who plays Via Pereira, JM's love interest in Mula Sa Puso). Make sure to grab a copy of Cosmopolitan's June 2011 issue with Heart Evangelista on the cover for JM's Man On Fire feature!